Field Spaniel is a sporting dog breed. At one time, the only thing that distinguished Cocker Spaniels from Field Spaniels was weight, the ‘under 25-pound’ variety being called Cocker Spaniel and the ‘over 25-pound’ variety Field Spaniel. The Cocker advanced in popularity while the Field Spaniel suffered terribly at the hands of breeders who, in attempting to create a sturdier sporting dog, ended up producing an awkward, long-backed, heavy-headed caricature of the original. 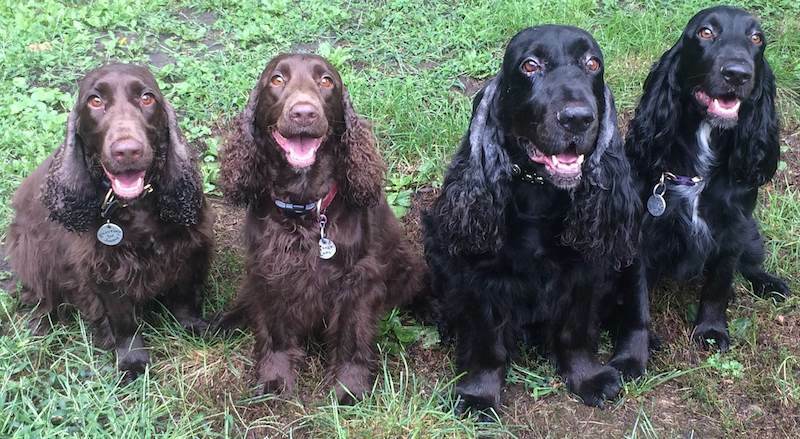 Springer and Cocker crosses were introduced to get rid of the exaggerations and restore the Field Spaniel dog breed to former type and working ability. 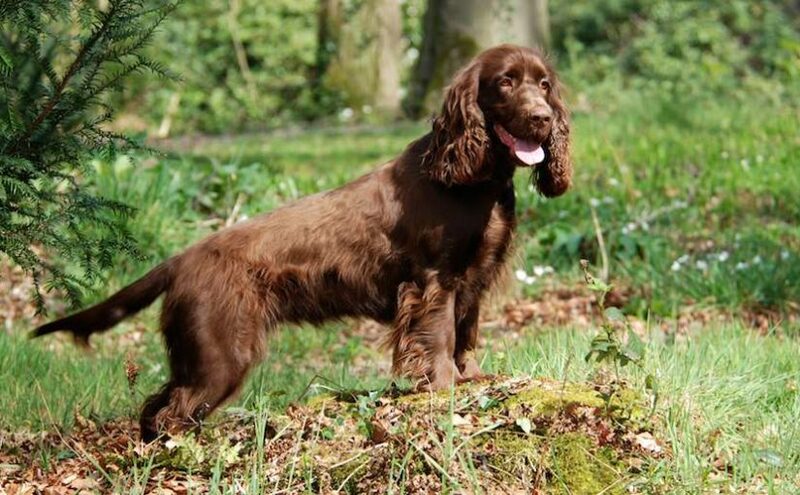 Field Spaniel Temperament: The Field Spaniel is fun-loving, independent and intelligent with an easygoing attitude. It has a great affinity for human companionship. General Appearance: That of a well-balanced, noble, upstanding sporting dog; built for activity and endurance. A grand combination of beauty and utility, and bespeaking of unusual docility and instinct. Coat and Colour: Coat flat or slightly waved, and never curled. Sufficiently dense to resist the weather, and not too short. Silky in texture, glossy, and refined in nature, with neither duffleness on the one hand, nor curl or wiriness on the other. On the chest, under belly and behind the legs, there should be abundant feather, but never too much, especially below the hocks, and that of the right sort, viz setter-like. The hindquarters should be similarly adorned. Colour: black, liver, golden liver, mahogany red, or roan; or any one of these colours with tan over the eyes and on the cheeks, feet, and pasterns. 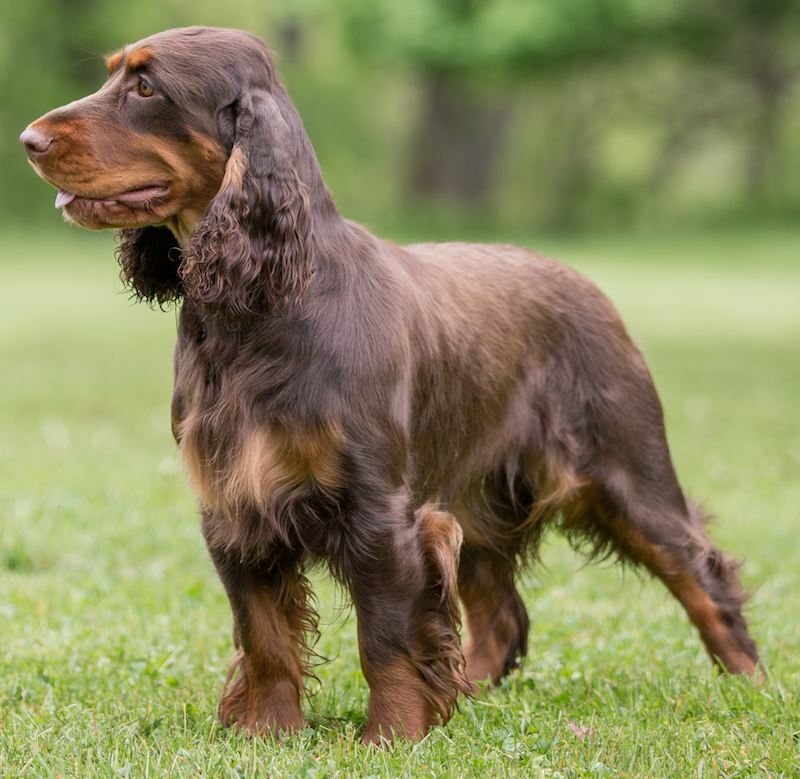 Other colours, such as black and white, liver and white, red or orange and white, while not disqualifying, will be considered less desirable since the Field Spaniel should be clearly distinguished from the Springer Spaniel. Head: Should be quite characteristic of this grand sporting dog, as that of the Bulldog, or the Bloodhound; its very stamp and countenance should at once convey the conviction of high breeding, character and nobility; skull well developed, with a distinctly elevated occipital tuberosity which, above all, gives the character alluded to; not too wide across the muzzle, long and lean, never snipey or squarely cut, and in profile curving gradually from nose to throat; lean beneath the eyes – a thickness here gives coarseness to the whole head. The great length of muzzle gives surface for the free development of the olfactory nerve, and thus secures the highest possible scenting powers. Nose well developed, with good open nostrils. Eyes not too full, but not small, receding or overhung, colour dark hazel or brown, or nearly black, according to the colour of the dog. Grave in expression and showing no haw. Ears moderately long and wide, sufficiently clad with nice Setterlike feather and set low. They should fall in graceful folds, the lower parts curling inwards and backwards. Neck: Long, strong and muscular, so as to enable the dog to retrieve his game without undue fatigue. Forequarters: Shoulders long, sloping and well set back, thus giving great activity and speed. Forelegs should be of fairly good length, with straight, clean, flat bone, and nicely feathered. Immense bone is no longer desirable. Body: Should be of moderate length, well ribbed up to a good strong loin, straight or slightly arched, never slack. Chest deep and well developed, but not too round and wide. Back and loin very strong and muscular. Hindquarters: Strong and muscular. The stifles should be moderately bent, and not twisted either in or out. Feet not too small; round, with short soft hair between the toes; good, strong pads. Tail: Well set on and carried low, if possible below the level of the back, in a straight line or with a slight downward inclination, never elevated above the back, and in action always kept low, nicely fringed with wavy feather of silky texture.